A purple clay (Zini) Yixing Chinese tea pot handmade by highly regarded artist Zhu Xinnan. The pot holds 340 milliliters, it comes with 4 matching cups. The word "Shipiao" means Stone Dipper. This design is one of my all-time favorite. 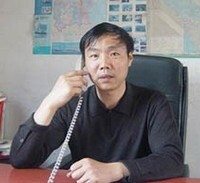 From this point of view, I think the maker of this pot - Zhu Xinnan （朱新南） has really done well. It is one of his prize-winning design. It won him a bronze model in the 4th China National Level Artistic Competition. The clay comes from the original clay mine of Yixing County: Huanglong Shan (Yellow Dragon Mountain). It is a high quality purple clay (Zini) that has been left to weather for 25 years before being crafted. While a new pot can feel rough, this pot is different. It is very smooth to touch, and gets better with seasoning. This pot comes highly recommended. We really feel it offers rare quality and excellent value of money. The pot holds 340 milliliters. It is suitable for 4 persons. It comes with 4 matching Yixing cups. This Yixing Chinese Tea Pot has 10 holes behind the mouth. We have tested it according to the guidelines of How to Buy Chinese Tea Set. You can be sure the lid fits tightly. If you were to fill it with water and invert, no water will spill. When you let the water go, it will stream out as far as 14 centimeters. 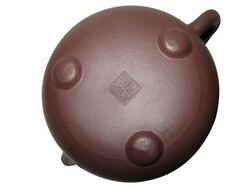 This tea pot will come with 4 matching cups made from lower grade Yixing purple clay. The price below also include courier shipping. For US and Western Europe, it will take 5 to 10 days to arrive. No other shipping charge is payable.